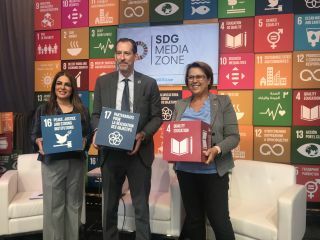 Namira Salim (left), founder of Space Trust, which has organized "Space 2030: Space as a Driver for Peace," alongside Robert Skinner, the executive director of the United Nations Office for Partnerships (UNOP) and Simonetta Di Pippo, director of the United Nations Office for Outer Space Affairs (UNOOSA), stand together on a panel at the SDGMediaZone at the United Nations. NEW YORK — Today (Sept. 25), leaders from around the world will gather at the United Nations Headquarters for Space2030: Space as a Driver for Peace, an event to support the peaceful activity of humans in space. As a species, we continue to push farther out into space. As missions through space agencies like NASA explore far out into our solar system, both government agencies and private companies send experiments and satellites into low earth orbit. At Space2030, leaders in space and politics will convene to create a vision of what peace in space will hopefully look like in the future. This will be the "first broad ranging vision dealing with space activities under the auspices of United Nations at a crucial time for the definition of the future of Space and Global Space Governance," representatives from the organization Space Trust said in an email to Space.com. Space2030 is organized by Space Trust in cooperation with the United Nations Office for Outer Space Affairs (UNOOSA) and the United Nations Office for Partnerships (UNOP). Space.com is a media partner of Space2030 and will be attending today's event. With this event, attendees aim to strengthen and encourage international collaboration and address challenges with space activities regarding safety, sustainability and more. The event is also concerned with space accessibility: These efforts additionally will support all nations, including developing nations, having equal access to space, Simonetta Di Pippo, an astrophysicist and director of UNOOSA, toldto Space.com. This could mean anything from being able to send technology or experiments into orbit to having access to data from space-based technologies and efforts. "The main goal [of Space2030] is to promote international cooperation for the peaceful uses [of space] and for sustainable development," Di Pippo said. She added that UNOOSA works to connect experts, the United Nations' member states, all of the space agencies, the private sector and NGOs to work toward these goals. "In a way, we connect the dots," she said. And Space2030: Space as a Driver for Peace aims to be a major stepping stone to connect these dots and work toward a peaceful future in space. One dignitary attending Space2030 is Nicos Anastasiades, President of the Republic of Cyprus, who sees space exploration as the realm of all countries. "For Cyprus it is a great honour to be part of this initiative. A noble initiative indeed, one that attempts to be a driver of peace," Anastasiades said. "Undeniably, the view of our planet Earth from space transcends national and political boundaries and I believe that cooperation in space technologies and exploration can be a uniting element for all humanity.‎'"